Farmers in Isaac's path, for better or for worse, include Randy Pettingill, seen here checking an ear of undersized corn near Plumerville, Ark., earlier this month. Thousands of farmers in drought-hit states will be seeing rain from Isaac, but the question many are wondering is whether it will be a blessing, curse or both. After deluging Louisiana and Mississippi, Isaac on Thursday reached into Arkansas, one of the driest farm states where too much rain could ruin some crops now being harvested. Farmers ran combines overnight Wednesday, the farm extension service at the University of Arkansas reported — after earlier tweeting this advice: "Harvest in a hurry". "If the corn blows over, it is next to impossible to get all of the corn into the combine," university agronomist Jason Kelley reported. 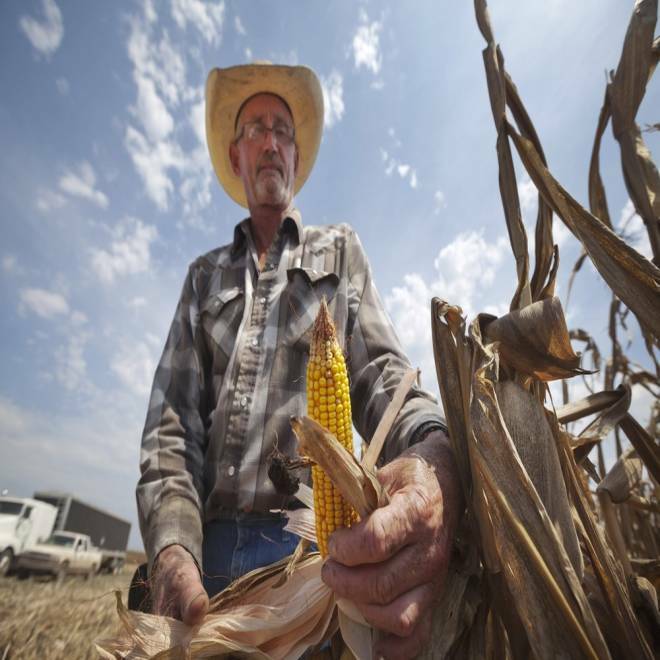 Nearly a quarter of the state's corn crop has yet to be harvested. Across the parched central U.S., "pasture, grazing lands and winter wheat" will benefit from the rains over the next few days, Brian Fuchs, a climatologist with the National Drought Mitigation Center, told NBC News. The rains might also help some soybean crops, added David Miskus, a meteorologist specializing in farm weather at the U.S. Climate Prediction Center. But too much rain could be bad news for corn and cotton. The big benefit from the rains, Fuchs said, will be "helping to recharge soils going into next year." The forecast calls for several inches of rain across the central U.S. over the next few days due to Isaac. In Indiana, Morgan County grain farmer Jeff Thomas told the Associated Press that farmers there are worried about too much rain too late in the growing season. "If we get all this water they're talking about, we'll have to deal with flooding, especially in fields along rivers. The rivers just can't hold all of that water," he said. But others have said even a flood would be more welcome than drought. In Morrilton, Ark., farmer Randy Pettingill was among those desperate after running out of water for his fields. "It's been a long summer," he recently told the extension service. "I'll take anything. I don't care if it comes a flood."